The Lord has chosen Donald Trump as the next president of the United States. At least Donald Trump’s lawyer Michael Cohen believes so. Perhaps if you were Donald Trump’s lawyer you might be persuaded to see America’s messiah coming in the clouds, too. There is a certain religious fervour surrounding his candidacy, and even the fulfilment biblical prophecy: ‘For the Lord himself shall descend from heaven with a shout, with the voice of the archangel, and with the TRUMP OF GOD..’ (1Thess 4:16). Honestly, some Christians believe this (really, no kidding). It’s all over the internet: “I believe Trump is the 45th President a 100% because the LORD GOD himself gave me 5 dreams and visions,” says the prophet Liz Alba, affirming the prophet Kat Kerr. It gets better: “It is also remarkable to note that Donald Trump (424) is the Gematria of ‘Messiah for the House of David’ (משיח בן דוד). 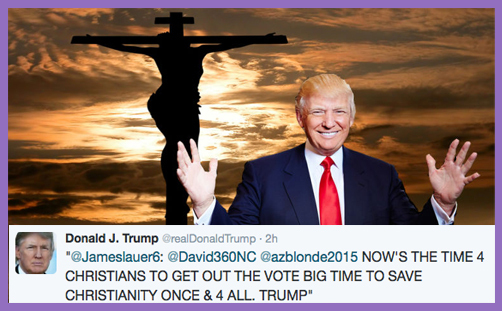 That is not to say that Donald Trump is the Messiah, but that his presidency will usher in the Messianic era…” The divine order goes: ‘God -> Jesus -> Donald Trump.’ They don’t say who comes next. Trump has long attracted a considerable following among white, Protestant Evangelicals: they regularly meet to pray for him (and with him). According to the Pew Research Center, “Now, fully 78% of white evangelical voters say they would vote for Trump if the election were held today, including about a third who ‘strongly’ back his campaign.” By contrast, religiously unaffiliated voters incline toward Hillary Clinton (56% support her, as against 19% for Trump). Evangelicals may be supporting Trump through gritted teeth, but when the alternative is Clinton, it isn’t at all clear to millions of Christians where the lesser evil lies. Trump has boasted of infidelities, profited off gambling, mocked the handicapped, cheered and offered financial assistance for his supporters who fight protesters, supported abortion (until his fortuitous change of heart before the election), called for war crimes against innocent people, demonized minorities and immigrants, knowingly played upon racist fears, promoted open racists through social media, promoted conspiracy theories, and crudely treated women. This country is the equivalent of that hijacked plane right now. We’re headed to a disaster, unless we can get control of the cockpit again… Ladies and gentlemen, this is a Flight 93 election. This may be our last shot. It’s time to roll. It’s time to run down the aisle and save Western civilization. Too many of the pastors — too many, practically all — in Germany refused to speak against national socialism. And look at the result: millions of Jews, pastors, priests, homosexuals, gypsies all lost their lives because everyone was afraid. What are you afraid of, a couple of bucks? Your tax-exempt status? What’s that going to do to you? Your churches may be closed anyway, because if a certain party gets elected, this certain party said, if the churches do not agree with our interpretation of women’s reproductive rights, they’ll just have to change their doctrine. …If a certain party gets elected, I can assure you what kind of judges are going to be on those appeals courts. …I’m not going to vote for a candidate who decides that we can redefine the meaning of marriage… Our opponents believe once they destroy the family, once they destroy the churches, they can re-create society in their own image and their own likeness. That, my friends, is not just political. That is diabolical. Get it straight, for crying out loud! The devil is in this! According to Fr Michael Orsi, if a certain party gets elected… it is the work of Satan. That certain party isn’t the GOP. There needs to nutty internet prophet to tell us that. In this culture war, Catholics for Trump have a duty to “vote the right way” and deliver us from evil. Presumably, they must turn a blind eye to his infidelity, adultery (he’s on his third marriage), gambling, greed, mocking of the handicapped, demonisation of immigrants and minorities, promotion of racism, conspiracy theories… Of course, in the great scheme of things, these personal foibles and offences matter less than the diminution of religious liberty. O, for the trump of God to sound a clear note.